Protest Torture in US Prisons – Rally Monday, Forum Thursday! The Hunger Strikers achieved real success: the conditions of systematic abuse and torture in the SHU—and widespread thru the prison system—were dragged into the light of day. Their original five core demands have now been acknowledged—although not yet met—by the California Department of Corrections and Rehabilitation (CDCR), which promised to consider them. On Monday, August 1 many diverse people and organizations will publicly speak out and act in support of these demands. Prisoners must gain the human rights and civil rights demanded by their very humanity—and by ours outside the prison walls too, wherever we may be. Let us show on August 1 that the prisoners do not stand alone, through our demonstrations, rallies, religious services, fasts, call-the-governor-days, art and music, taking to the airwaves thru talk show and other call-ins, and many other public, visual, and creative expressions. Beginning on July 1, 2011, hundreds of prisoners in California’s Pelican Bay SHU (“Security Housing Unit”) began a historic hunger strike to demand an end to long-term solitary confinement, which constitutes torture under international law, and other demands to end the cruel and inhumane treatment they suffer under. The hunger strike rapidly spread to more than 6,500 prisoners in over one-third of California’s prisons, making their heroic stand the most significant prisoner-led resistance in the U.S. in decades. 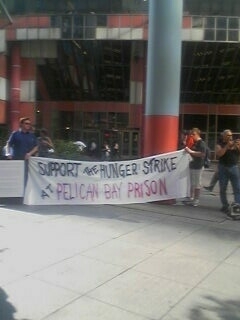 After going without food for 20 days, the prisoners at Pelican Bay ended their hunger strike, with a call to people on the outside to continue the struggle against torture in U.S. prisons and to ensure their demands are met and that they are not retaliated against for their peaceful political protest. As of Friday, July 22, California prison administrators reported hundreds of prisoners at California’s Corcoran SHU remained on hunger strike, and families reported as of July 26 that prisoners at Corcoran continued to refuse food. The prisoner’s demands and more details are available here. The use of long-term isolation pervades the U.S. prison system, with tens of thousands of prisoners held in conditions that violate international standards against torture. Join us for a discussion of the courageous stand taken by thousands of prisoners across California and the widespread, systematic use of long-term solitary confinement in U.S. prisons – including in Illinois – the effects of torture on its survivors and what people of conscience can do. The courageous actions of the prisoners in California risking their lives on hunger strike have dragged the hidden humanitarian crisis that is the pervasive use of long-term isolation in U.S. prisons into the light – anyone concerned about human rights must be part of this discussion. * Dr. Antonio Martinez, a psychologist with the Institute for Survivors of Human Rights Abuses and co-founder of the Marjorie Kovler Center for the Treatment of Survivors of Torture. Dr. Martinez has lectured about the trauma and consequences of torture and abuse throughout the world. * Alan Mills, Legal Director of the Uptown People’s Law Center. The People’s Law Center has has been engaged in litigation to change conditions at Tamms, Illinois supermax prison, since the day it opened. * Stephen F. Eisenman, Professor of Art History at Northwestern University. He is the author of (among other books) Gauguin’s Skirt (1997) and The Abu Ghraib Effect (2007). He is also a prison reform activist with Tamms Year Ten, and regularly publishes his criticisms of the “penal state” in The Chicago Sun Times and Monthly Review. Prof. Eisenman is currently completing a book entitled Meat Modernism concerned with the image of animals in Western Art from the mid 18th Century until today. Moderated by Gregory Koger, social justice activist who as a youth spent over six years straight in solitary confinement in prison in Illinois. 3. Momentum is building for the Summer of Trust, July 31 to August 6, in Germantown, MD. Activists from 16 states (and counting!) will be standing with Dr. Leroy Carhart when he is targeted by “Summer of Mercy 2.0,” the same fanatics who targeted Dr. George Tiller, leading to his assassination in 2009. To understand why this is so important, read “From Wichita to Germantown: Standing with Dr. Carhart,” by Kari Ann Rinker, NOW Kansas, and “Abortion Doctor Leroy Carhart is a Hero, Operation Rescue Threatens Him,” by Sunsara Taylor. Watch Dr. Carhart’s video invitation. The Kick-off Walk at 1 pm on Sunday, July 31, will raise funds for the Abortion Access Fund, and Words of Choice will perform at 5 pm. Whether you can make it to Maryland or not, you can fund an activist to participate and spread the word to friends around the country. Contributions are being accepted to help fund Dr. Carhart’s work too. What we each do will make a world of difference. This workshop will include meditation instruction and manageable meditation periods, as well as meditative techniques to use during actions. This is an introduction to practical meditation for social justice activists. The day will also include open discussion on meditative perspectives on activism, for example: sustainable activism without succumbing to burn-out or feeling overwhelmed; and more. The workshop will be led by Taigen Dan Leighton, Soto Zen Buddhist teacher and committed activist engaged in peace and justice organizing for many decades. Please be sure to rsvp as space is limited. Chicago World Can’t Wait will be bringing the message of We Are Not Your Soldiers and support for Bradley Manning to this extravagant promotion of military might that covers up the mass death and destruction it spreads around the globe. More details coming soon. ← A Summer of Heroism and Resistance and How You Can Be A Part of It!